It was whilst I was designing and making this shawl that I kept thinking, it reminds me of a Custard Cream biscuit, (so, I obviously just HAD to go buy some, and I really had forgotten how lovely these traditional biscuits are, the perfect dunkers, with a nice cup of tea) …… and so the shawl was named, the Custard Cream shawl. 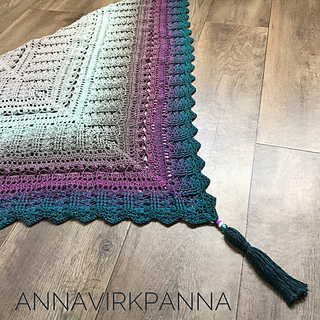 This sweet treat of a shawl is fabulously textured and uses simple stitches to wonderful effect. I hope you love a Custard Cream as much as I do! 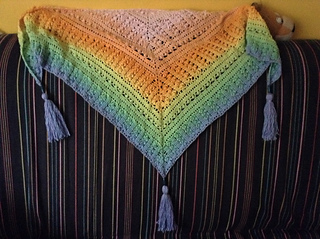 I had 30g left of a Scheepjes Whirl, tassels included, a total of 960metres of yarn. The Whirl is 1000m in total length and is 4ply. 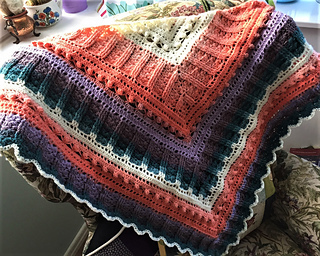 The pattern is available in both UK terms and US terms.